Borletti-Buitoni Trust Fellowship winner (2007) Irina Zahharenkova is equally at home with piano, fortepiano and harpsichord. She is also happy to be Russian, Estonian or Finnish and is frequently referred to as any one of them! When asked which she is, she politely rejects the notion of being categorized according to nationality. Born in Kaliningrad in 1976, she obtained her Master of Music degree at the Estonian Academy of Music and Theatre with Prof. Lilian Semper and at the Sibelius Academy in Finland with Prof Hui-Ying Líu-Tawaststjerna and she now teaches piano herself at both academies. In addition to piano she explored early keyboards, studying harpsichord with prof. Maris Valk-Falk and fortepiano with Prof. Pekka Vapaavuori. Irina Zahharenkova has won countless awards including first prizes at major international piano competitions, including the International Johann Sebastian Bach Competition (Leipzig, Germany – 2006), Alessandro Casagrande International Piano Competition (Terni, Italy – 2006) International Competition George Enescu (Bucharest, Romania – 2005), and Jaén International Piano Contest (Jaén, Spain – 2004). In 2008 she became prize-winner at the Artur Rubinstein Piano Master Competition in Tel Aviv, Israel. Irina Zahharenkova embraces a wide repertoire from Baroque to contemporary, played across all three keyboards – and she acknowledges that the variations of playing, intonation and improvisation associated with these three different instruments has influenced her playing on any one of them. As well as solo piano and harpsichord recitals across Europe and in Japan, she appears at key festivals such as Klavier-Festival Ruhr in Germany, Spoleto Festival in Italy, Kuhmo Chamber Music Festival in Finland, Bergen International Festival in Norway and has also appeared as soloist with orchestras including Orchestre de la Suisse Romande, Orchestre National de Lorraine, Israel Philarmonic Orchestra, Pilsen Philharmonic Orchestra, Helsinki Philharmonic Orchestra, Prague Chamber Orchestra, Estonian National Symphony Orchestra and Sinfonia Finlandia, among others. 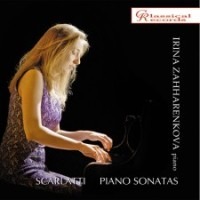 Irina Zahharenkova was awarded a Borletti-Buitoni Trust Fellowship in 2007 and used the funds primarily to support the recording and promotion of two CDs with Classical Records in Moscow; Bach’s Goldberg Variations (released in 2010) and the current Scarlatti Sonatas.